People love to get mad, especially before all of the facts are in. We see it quite a bit here at Phone Arena, because a big part of our trade is in rumors, which still serve to enrage quite a few people, despite having no verifiable connection to the truth. Of course, there is also the trouble with perspective. From the perspective of some, the facts don't matter and all actions taken by Google, Apple, Samsung, et al will be met with outrage. Today, we saw this first hand because of a story by The Wall Street Journal regarding a Google SEC filing from December. Some might note that Google's statement only mentions current and past plans for Nest, and doesn't specifically rule out future plans. Google rarely will completely rule out any potential ad targets, but there have been plenty of times when Google tested out certain ad strategies and abandoned them because they would cause too much discomfort for users. Haters gotta hate. C'mon, it's a thermostat, what possible ad could they put on a device that you only check periodically? No one would buy one even if they did. They were willing and not. Everyone one and eveything got syped on. But Mircosoft did more than that. Mircosoft had a department through Hotmail that delt with the US government handing over information "illegally". The NSA spying is one thing Mircosoft just handing it over is another. If that's the new evil then Google is a boy scout. As a HVAC service tech and an Android nerd I can take a guess. 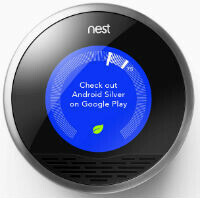 Nest is all about Android@Home smarthomes. Google need the patents that Nest had. In its form now now Adds are a no. Someday when it's a tablet you dock on the wall it will have adds. Google is also about to inherit their patents problems too. Honeywell is in a "Thermostat Patent War" with Nest. Also as a HVAC service tech I recommend you stay away from Nest they're crap. "People love to get mad, especially before all of the facts are in." Google already has admitted to a policy of collecting, sharing, and selling Nest data. It is logical to think they will make available some cheaper version of Nest that gives you ads all the time. People are mad mostly because so many things have become one-sided. This one-sidedness has become part of people, how they look at the world, is even reflected in many forum "discussions". When did they admit that? Yeah, sure. Um, two things. 1. Casey Johnson is a nutcase who usually comes up with BS in her articles at ars, postulating several scenarios that have no basis in reality, like thinking the insurance company would get the data to price your insurance if the alarm went off a lot 2. This was done previously before Nest became part of Google. "It is logical to think they will make available some cheaper version of Nest that gives you ads all the time." Lets think about this for a min...Nest..and fridge....both were bought up in the other article... Your post got me thinking...how many times a day would we even look at the thermostat and fridge for ads to even be a factor? How many ppl adjust thermostats manually alot? I usually set it for a specific temp and it adjusts on its own. I get some ppl are upset about ads, ads, ads...but step back and think about it for a min. Like I said in a different post, "ads" are just a flimsy excuse Google uses for its invasive and pervasive data collection efforts. Being able to "help" someone -- "Google Now" -- is the other reason uses to datamine people. So maybe Google uses the "we want to help you" card with Nest. It doesn't really matter as they have all the data anyway. Same goes with the refrigerator. As soon as there is "Google Inside", you can be sure all your data goes outside. The thing is google can't just do anything with the data they have, hence why there are laws and Googles business is built on trust and the moment they cross that line they will lose customers Trust and once they lose customers Trust they have no business. It's in Googles best interest to make sure our data is safe and considering there hasn't been no major breach yet at Google I would say they doing a good job of protecting our data. Once again, Michael H. Rushes to Google's defense for something Google has not only stated they would do, but actions that they do on a regular basis and comprise the backbone of their business (Data mining, ads, and policies shifts after acquisitions). I don't expect anything to change in the future, regardless of one swooning writer's "chivalrous" deeds.